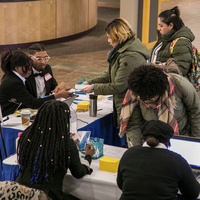 Students must have submitted an RSVP through Campus Connect and purchased regalia through the DePaul Barnes & Noble bookstore (online or in person) to receive guest tickets. Don’t think you’ll use all your commencement tickets? Do your classmates a favor by releasing unneeded tickets at Early Ticket Pick Up—you’ll receive a ticket for a raffle to win a diploma frame for each ticket you release. Details on the lottery to receive additional tickets will be shared soon.